Bialystok ([b?ja?wistok is the largest city in northeastern Poland and the capital of the Podlaskie Voivodeship. 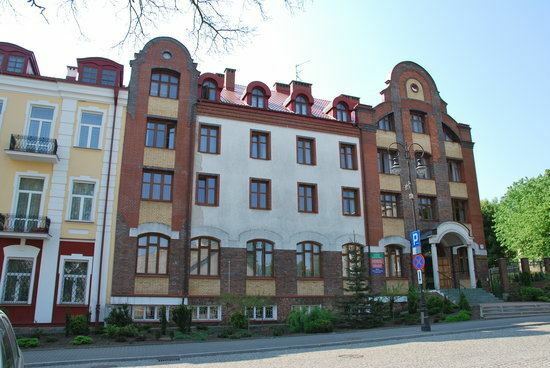 Located in the Bialystok Uplands (Polish: ) of the Podlaskie Plain (Polish: ) on the banks of the Biala River, Bialystok ranks second in terms of population density, eleventh in population, and thirteenth in area, of the cities of Poland. It has historically attracted migrants from elsewhere in Poland and beyond, particularly from Central and Eastern Europe. This is facilitated by the fact that the nearby border with Belarus is also the eastern border of the European Union, as well as the Schengen Area. The city and its adjacent municipalities constitute Metropolitan Bialystok. The city has a Warm Summer Continental climate, characterized by warm summers and long frosty winters. Forests are an important part of Bialystoks character, and occupy around 1,756 ha (4,340 acres) (17.2% of the administrative area of the city) which places it as the fifth most forested city in Poland. The first settlers arrived in the 14th century. A town grew up and received its municipal charter in 1692. Bialystok has traditionally been one of the leading centers of academic, cultural, and artistic life in Podlaskie and the most important economic center in northeastern Poland. In the nineteenth century Bialystok was an important center for light industry, which was the reason for the substantial growth of the citys population. But after the fall of communism in 1989 many of these factories faced severe problems and subsequently closed down. Through the infusion of EU investment funds, the city continues to work to reshape itself into a modern metropolis. Bialystok in 2010, was on the short-list, but ultimately lost the competition to become a finalist for European Capital of Culture in 2016. Over the centuries Bialystok has produced a number of people who have provided unique contributions to the fields of science, language, politics, religion, sports, visual arts and performing arts. This environment was created in the mid-eighteenth century by the patronage of Jan Klemens Branicki for the arts and sciences. These include Ryszard Kaczorowski, the last emigre President of the Republic of Poland; L. L. Zamenhof, the creator of Esperanto; and Albert Sabin, the co-developer of the polio vaccine. Archaeological discoveries show that the first settlements in the area of present day Bialystok occurred during the Stone Age. Tombs of ancient settlers can be found in the district of Dojlidy. In the early Iron Age a mix of Prussians, Yotvingians and Wielbark culture people settled in the area producing kurgans, the tombs of the chiefs in the area located in the current village of Rostolty. Since then, the Bialystok area has been at the crossroads of cultures. Trade routes linking the Baltic to the Black Sea favored the development of settlements with Yotvingia-Ruthenian-Polish cultural characteristics. The city of Bialystok has existed for five centuries and during this time the fate of the city has been affected by various political and economic forces. Surviving documents attest that around 1437 a representative of the Raczkow family, Jakub Tabutowicz of the coat of arms Labedz, received from Michael Zygimantaitis son of Sigismund Kestutaitis, Duke of Lithuania, a wilderness area along the river Biala that marked the beginning of Bialystok as a settlement. The first brick church and a castle were built between 1617 and 1826. The two-floor castle, designed on a rectangular plan in the Gothic-Renaissance style, was the work of Job Bretfus. Extension of the castle was continued by Krzysztof Wiesiolowski, starost of Tykocin, Grand Marshal of Lithuania since 1635, and husband of Aleksandra Marianna Sobieska. In 1637 he died childless, and as a result Bialystok came under the management of his widow. After her death in 1645 the Wiesiolowski estate, including Bialystok, passed to the Commonwealth to cover the costs of maintaining Tykocin Castle. In the years 1645–1659 Bialystok was managed by the governors of Tykocin and was part of the Grand Duchy of Lithuania. In 1661 it was given to Stefan Czarniecki as a reward for his service in the victory over the Swedes during the Deluge. Four years later, it was given as a dowry of his daughter Aleksandra, who married Hetman Jan Klemens Branicki, thus passing into the hands of the Branicki family. In 1692, Stefan Mikolaj Branicki, the son of Jan Klemens Branicki (Marshal of the Crown Court), obtained city rights for Bialystok from King John III Sobieski. He constructed the Branicki Palace on the foundations of the castle of the Wiesiolowski family. In the second half of the eighteenth century the ownership of the city was inherited by Field Crown Hetman Jan Klemens Branicki. It was he who transformed the palace built by his father into a magnificent residence of a great noble. The end of the eighteenth century saw the division of the Polish–Lithuanian Commonwealth, in three steps, among the neighboring states. The Kingdom of Prussia acquired Bialystok and the surrounding region during the third partition. The city became the capital of the New East Prussia province in 1795. Prussia lost the territory following Napoleon Bonapartes victory in the War of the Fourth Coalition as the resultant 1807 Treaties of Tilsit awarded the area to the Russian Empire, which organized the region into the Belostok Oblast, with the city as the regional center. At the end of the nineteenth century, the majority of the citys population was Jewish. According to Russian census of 1897, out of the total population of 66,000, Jews constituted 41,900 (so around 63% percent). This heritage can be seen on the Jewish Heritage Trail in Bialystok. The first Anarchist groups to attract a significant following of Russian workers or peasants, were the Anarcho-Communist Chernoe-Znamia groups, founded in Bialystok in 1903. The Bialystok pogrom occurred between 14–16 June 1906 in the city. During the pogrom between 81 and 88 people were killed, and about 80 people were wounded. During World War I the Bialystok-Grodno District was the administrative division of German-controlled territory of Ober-Ost. It comprised the city, as the capital, and the surrounding Podlaskie region, roughly corresponding to the territory of the earlier Belostok Oblast. At the end of World War I the city became part of the newly independent Second Polish Republic, as the capital of the Bialystok Voivodeship (1919–1939). During the 1919-1920 Polish-Soviet War, possession of the city by the Red Army and the Provisional Polish Revolutionary Committee occurred during the lead up to the Battle of Warsaw. During the resultant counteroffensive, the city returned to Polish control after the Battle of Bialystok. With the beginning of World War II, Poland was invaded by Nazi Germany and the Soviet Union, and initially the city came under Soviet control, as a result of the Molotov-Ribbentrop Pact. It was incorporated into the Byelorussian SSR from 1939 to 1941 as the capital of the Belastok Voblast. After the Nazi attack on Soviet Union in 1941, Bialystok was occupied by the German Army on 27 June 1941, during the Battle of Bialystok–Minsk, and the city became the capital of Bezirk Bialystok, a separate region in German occupied Poland, until 1944. From the very beginning, the Nazis pursued a ruthless policy of pillage and removal of the non-German population. The 56,000 Jewish residents of the town were confined in a ghetto. On August 15, 1943, the Bialystok Ghetto Uprising began, and several hundred Polish Jews and members of the Anti-Fascist Military Organisation (Polish: ) started an armed struggle against the German troops who were carrying out the planned liquidation of the ghetto with deportations to the Treblinka extermination camp. The city was liberated by the Red Army on 27 July 1944 and on 20 September 1944 transferred to Poland. After the war, the city became capital of the initial Bialystok Voivodeship (1945–1975) of the Peoples Republic of Poland. After the 1975 administrative reorganization, the city was the capital of the smaller Bialystok Voivodeship (1975–1998). Since 1999 it has been the capital of the Podlaskie Voivodeship, Republic of Poland. Bialystok is situated in the Bialystok Uplands (Polish: ) of the Podlaskie Plain (Polish: ), part of what is known collectively as the Green Lungs of Poland. The Biala River, a left tributary of the Suprasl River, passes through the city. The landscape of the Bialystok Upland is diverse, with high moraine hills and kame in excess of 200 m (660 ft) above sea level. Vast areas of outwash, a glacial plain formed of sediments deposited by meltwater at the terminus of a glacier, are covered by forests. Forests are an important part of the city character, they currently occupy approximately 1,756 ha (4,340 acres) (17.2% of the administrative area of the city) which places it as the fifth most "wooded" city in Poland; behind Katowice (38%), Bydgoszcz (30%), Torun (22.9%) and Gdansk (17.6%). Part of Knyszyn Forest is preserved within the city limits by two nature reserves—a total area of 105 ha (260 acres). The Zwierzyniecki Forest Nature Reserve (Polish: ), which is contained within the city limits, is a fragment, 33.48 ha (82.7 acres), of the riparian forest with a dominant assemblage of oak and hornbeam. The Antoniuk Nature Reserve (Polish: ) is a 70.07 ha (173.1 acres) park in the city that preserves the natural state of a forest fragment characteristic of the Bialystok Upland, with a dominant mixed forest of hazel and spruce. The 40 ha (99 acres) of forests lying in the vicinity of the Dojlidy Ponds are administered by the Central Sports and Recreation Center in Bialystok (Polish: – MOSiR). The Dojlidy Ponds recreation area includes a public beach, walking trails, birdwatching and fishing. The city has a Warm Summer Continental or Hemiboreal climate (Dfb) according to the Koppen climate classification system, characterized by warm temperatures during summer and long and frosty winters. It is substantially different from most of the other Polish lowlands. The region is one of the coldest in Poland, with the average temperature in January being ?6 °C (21 °F). The average temperature in a year is 7 °C (45 °F). The number of frost days ranges from 50 to 60, with frost from 110 to 138 days and the duration of snow cover from 90 to 110 days. Mean annual rainfall values oscillate around 580 mm (22.8 in), and the vegetation period lasts 200 to 210 days. 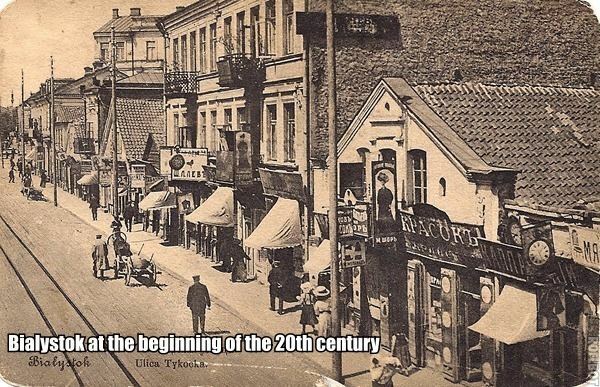 In the nineteenth century Bialystok was an important center for light industry, which was the reason for the substantial growth of the citys population. The tradition continued with many garment factories established in the twentieth century, such as Fasty in the district of Bacieczki. However, after the fall of communism in 1989 many of these factories faced severe problems and subsequently closed down. Bialystok is one of the largest cultural centers in the Podlaskie Voivodeship. The attractions include performing arts groups, art museums, historical museums, walking tours of architectural / cultural aspects and a wide variety of parks and green spaces. Bialystok in 2010 was on the short-list, but ultimately lost the competition, to become a finalist for European Capital of Culture in 2016. The Historical Museum in Bialystok (Polish: ) is part of the Podlaskie Museum. The facility has a rich collection of archival materials and iconography illustrating the history of Bialystok and Podlasie, and a number of middle-class cultural relics, especially in the field of craft utility. There are also the Numismatic Cabinet of the collection of 16 000 coins, medals and securities. The museum is in possession of the only collections in the country memorabilia connected with the Tatar settlement on the Polish–Lithuanian–Belarusian region. The Army Museum in Bialystok (Polish: ) was established in September 1968 as a branch of the Podlaskie Museum to house the research and collections of many people connected with military history of north-eastern Poland. The Ludwik Zamenhof Centre (Polish: ) offers the visitors a permanent exhibition, Bialystok of Young Ludwik Zamenhof, and various temporary exhibitions, concerts, film projections, and theatre performances. The Centre has a branch of Lukasz Gornicki’s Podlaska Library dedicated to the Esperanto language.